If your bathroom is in need of a major makeover then keep on reading. This Old House currently listed a few of the hottest bathroom trends that were recently seen at the Kitchen and Bath Industry show. The first involves giving your bathroom a high-tech twist. Technology is now invading the bathroom, with audio installations and ambiant lighting found in steam showers and cabinets. 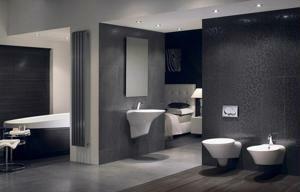 Even toilets are getting an upgrade, with recent models from Kohler having customizable seat temperatures. Another trend that seems to be hitting bathrooms everywhere is seamless bathroom vanities with efficient storage designs. These modern vanities effectively make use of the space around them, but at the same time, provide enough visual appeal to make them the centerpieces of any room. Finally, nature-inspired tiles of all shapes and sizes were being showcased at the event, according to the news outlet. From floral cherry blossoms to bamboo textures, these tiles are perfect for anyone who would like to transform their space into a relaxing, unforgettable sanctuary.